than to be unprepared but right! Current Commentary -- Where Are We Now? The story today of unexpected and disappointing earnings by Endeavour Silver (EXK) is a reminder of what can happen very quickly when investors don't hear what they want to hear. EXK is not alone as many mining stocks have been taken out back and their stock price given a brutal whooping when investors were disappointed by their earnings reports. EXK closed today down over -22% from yesterday's highs (red arrow). Gold stock investors are already in a sour mood (see my previous article Gold Stock Sentiment & Fund Flows) so when they get upset over earnings details, they don't hold any punches. This is a clear example of why I have been so cautious about declaring a new gold stock bull rally. EXK price yesterday just barely tickled the top (red) resistance line but had not yet broken above it on a closing basis. The (yellow) box is just under the lower (blue) support line around 2.87 and represents the most likely area where sell stops were lurking, as evidenced by the price gap as it fell through. This is a textbook example of waterfall crash. These are largely caused by stop-runs, as one sell stop causes the price to fall far enough to trigger another sell stop at a lower price, and then that recursively feeds on itself until it exhausts itself. The chart shows that the initial stop run ran all the way down to $2.60 before it hit a large-enough buy stop to kill the run. By then investors were jumping from the burning ship, so that caused the price to fall further, closing the day at $2.43. After-hours traded down to $2.41 as I am writing this article. Often times, these waterfall events carry over into the next trading session once otherwise oblivious investors read the news after work today and then place their sell orders for tomorrow. 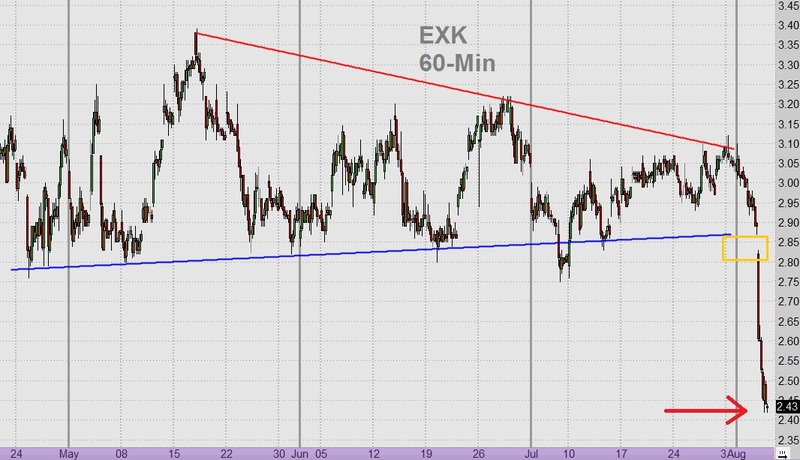 If gold & silver hold their price and/or rally tomorrow, then the EXK price chart could show a "V" bottom -- but enough damage has been done that prices are unlikely to recover very far any time soon. Carry-over selling tomorrow could carve another 4-5% from the price. Below, there is some support at $2.35 and below that perhaps around $1.90. The 2016 low was $1.00. Personally, I think the selling was way overdone. But given the overall pessimism in gold stocks, I am not at all surprised. I threw out a stink bid on EXK near the close and got filled at $2.436 so we'll wait to see if that was prudent by the time we hear the next earnings report in November. I plan to manage the carryover downside risk with 10-12 cent range (just below $2.35 support) before I will consider exiting this trade. Gold stock bull market in progress? While confidence is still hanging on -- despite what happened today to EXK -- we're still not there yet. Return to the main CyclePro Outlook page.